Cameron and Tyler Winklevoss are American entrepreneurs. They are the founders of Gemini, as well as the owners of Winklevoss Capital, a venture capital and private equity company. They also participated in the 2008 Beijing Olympics, placing second in the semi-finals for the U.S. Rowing Team. 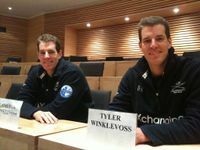 Tyler and Cameron Winklevoss grew up in Pennsylvania. They attended Harvard University, graduating in 2004. It was during this time that they began working on social media platform called ConnectU. Tyler and Cameron later sued their classmate Mark Zuckerberg, accusing him of stealing their idea to create Facebook; the resulting legal battle eventually led to a $65 million settlement in their favor. The Winklevoss twins invested $11 million in bitcoin in 2013, when the price was around $120. By late 2017, when the value of bitcoin surpassed $10,000 per coin, that investment became worth over $1 billion. Tyler Winklevoss has said that he believes it to be a "very real possibility" that the market cap for bitcoin could be in the trillions. Cameron and Tyler Winkelvoss are also majority owners of Gemini, the digital asset exchange they founded in 2015. In March 2017, the SEC rejected Cameron and Tyler Winklevoss' proposal to list a bitcoin ETF on Cboe's Bats BZX Exchange, which was originally proposed in 2013. According to the SEC's statement, this was due in large part to the lack of regulation for bitcoin "to prevent fraudulent and manipulative acts and practices and to protect investors and the public interest." In June 2018, the twins tried again, submitting a second, amended proposal to the SEC to trade bitcoin ETF shares through the Bats BZX exchange. Once again, the SEC rejected the proposal, citing lack of sufficient market surveillance and strong evidence for the proposal's claims that the bitcoin market is "strongly resistant to manipulation." Following the news, the price of bitcoin dropped by 3.6 percent. In September 2018, Cameron and Tyler Winklevoss received approval from the New York Department of Financial Services to launch the Gemini dollar, a stablecoin backed by funds held by the State Street corporation. Cameron and Tyler Winklevoss were investors in BitInstant, an early cryptocurrency exchange created by Charlie Shrem. In November 2018, the Winklevoss twins filed a lawsuit against Shrem in a federal court. The lawsuit accused Shrem of spending 5,000 bitcoin that Shrem had owed to them since 2012, which the Winklevoss twins suspected to be the source of funding for Shrem's multiple properties, cars, and boats. Some of Shrem's assets were frozen as a result, and his lawyer told the New York Times that Shrem was innocent. According to an affidavit filed in court, Shrem had also not paid the U.S. federal government the $950,000 he had agreed to pay in restitution as part of his plea in 2014. In February 2019, the U.S. District Court of the Southern District of New York ordered Cameron and Tyler Winklevoss to pay Shrem $45,000 in legal fees incurred during the lawsuit. Cameron and Tyler Winklevoss attended Harvard University, graduating in 2004. Later they both attended Oxford University, graduating with MBAs in 2010. ↑ Why Cameron Winklevoss drives an 'old SUV' even though the twins are bitcoin billionaires. CNBC. ↑ THE CODE OF THE WINKLEVII. Vanity Fair. ↑ Pfamous Alumni. Harvard University. ↑ The Winklevoss Twins Now Appear to Be Bitcoin Billionaires. Time Magazine. ↑ Winklevoss Twins Used Facebook Payout to Become Bitcoin Billionaires. Fortune. ↑ The Winklevoss twins are now Bitcoin billionaires. The Verge. ↑ How the Winklevoss Twins Found Vindication in a Bitcoin Fortune. The New York Times. ↑ How the Winklevoss Twins Found Vindication in a Bitcoin Fortune. CNBC. ↑ Winklevoss twins file for $20 Million IPO of bitcoin trust fund. Coindesk. ↑ SEC Rejects Winklevoss Bitcoin ETF Bid. Coindesk. ↑ SEC Orders Review of Winklevoss Bitcoin ETF Rejection. Coindesk. ↑ SEC Rejects Winklevoss Bitcoin ETF, Sending Price Tumbling. Forbes. ↑ Winklevoss twins bitcoin ETF rejected by SEC. CNBC. ↑ Winklevoss-Backed Bid for Bitcoin-ETF Rejected by Regulators. Bloomberg. ↑ Charlie Shrem Says He Never Owned Bitcoin Claimed Stolen By Winklevosses. Coindesk.com. ↑ Bitcoin’s ‘First Felon’ Faces More Legal Trouble. The New York Times. ↑ Bitcoin’s ‘First Felon’ Faces More Legal Trouble. Coindesk. ↑ There’s now a billion more reasons to hate the Winklevoss twins. NY Post. This page was last edited on 8 February 2019, at 17:44.